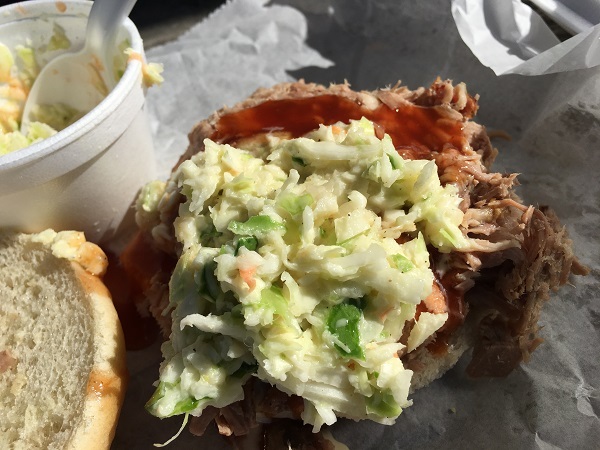 Helen’s Bar-B-Q, Brownsville TN – Marie, Let's Eat! For a late lunch on our way home, we visited one of the most celebrated barbecue places in west Tennessee, a restaurant I’d been wanting to try for many years. Is there anybody in this hobby who hasn’t heard of Helen’s? I hadn’t when we first started writing about food seven years ago, but I wasn’t as voracious a reader back then, either. It’s a small place with a dirt parking lot and a huge reputation. So many of the writers whose work I enjoy have praised this place that I’ve been hoping for a chance to visit for years. I figured it would be Scott’s-Parker one direction and Helen’s the other. And, like Scott’s-Parker, there was an additional bit of online hype in the weeks before our trip. This time out, Daniel Vaughn and Robert Moss, collaborating for First We Feast, selected Helen’s to represent Tennessee in their argument-starting rundown of the best barbecue from every state. 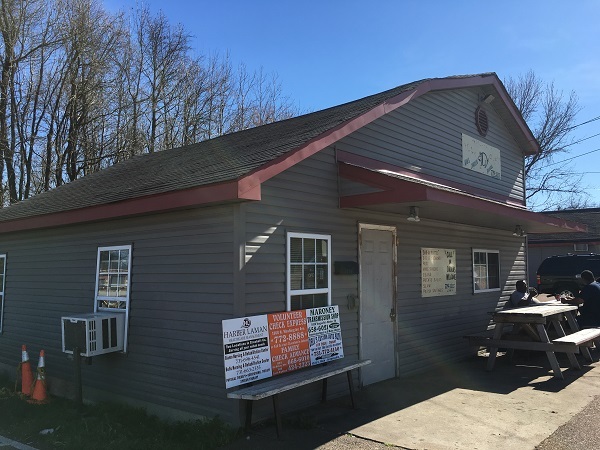 Helen Turner worked at this little barbecue place under two different owners before she bought the business and made it her own. Brownsville, like Lexington, is ideally situated for travelers willing to make a very reasonable detour from I-40, and when writers started telling their audiences just how good Turner’s work is, those travelers started coming in numbers that still surprise the locals. Turner’s commitment to smoke the meat and cook all the sides herself earned her the name The Queen of Barbecue, and her court entertains visitors from every distant land. We shared a picnic table with three other people. There’s good barbecue in Chattanooga, I said, but nothing this good. “Shoulda moved here,” a guy replied. Earlier, we had said goodbye to Marie’s siblings about 2, and made a quick stop in the nearby Cooper-Young neighborhood for Marie to dip into a new sci-fi specialist bookshop called Two Rivers while I circled the block. We got back to the interstate and made it to Brownsville in just under an hour, and then tried to drive right past Helen’s. It doesn’t have a big, fancy sign or anything, but I bet if you roll your windows down, you’ll smell the delicious smoke before you see the building. The restaurant is quite small, and odds are you’ll either be eating in your car or sharing a picnic table out front with some other folks. I was interested to read that at Helen’s, the bologna and the Polish sausage are possibly every bit as popular as the chopped pork, but those will wait for our next trip to west Tennessee. This time out, Marie and I just had the pork and we completely loved it. For people looking for smoky, tender, just-moist-enough barbecue, this meat is darn near perfect. Get it dry to taste it without the sauce, and then go nuts, because this sauce is excellent. With a little more tomato or ketchup in the recipe, it’s redder than the sauces you typically find in Memphis (and in Chattanooga), and doesn’t have that “sticky” feel. A plate comes with three sides, beans, slaw, and potato salad. It’s all homemade and all amazing. It’s a mayo slaw, but with a little less mayo than most. The potato salad is just unreal, so creamy and delicious that I threw out my rule against the calorie-packed side and indulged to the point of running my finger along the styrofoam and licking it clean. Helen’s is probably going to become a usual stop for us between Nashville and Memphis. It’s not like we’re out there very often – maybe once a year for now – but this place is so good that it would be a criminal shame to miss it on future trips. We’ll certainly dig a little deeper into the menu next time as well. Posted on May 26, 2017 by Grant G.Posted in barbecue, jackson, tennesseeTagged barbecue, brownsville, jackson, tennessee. 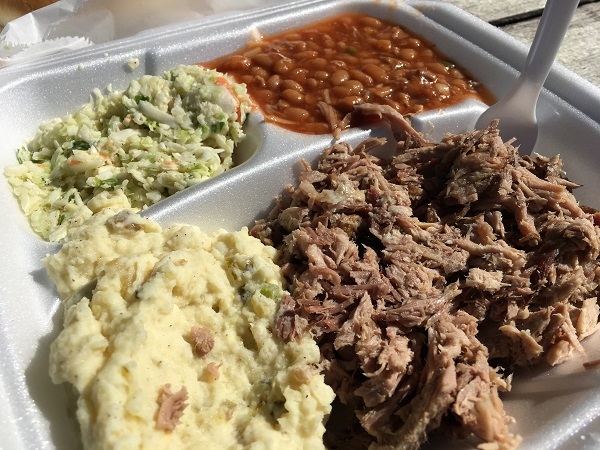 Pingback: Modish Taste | Helen’s Bar-B-Q, Brownsville TN – Marie, Let’s Eat!